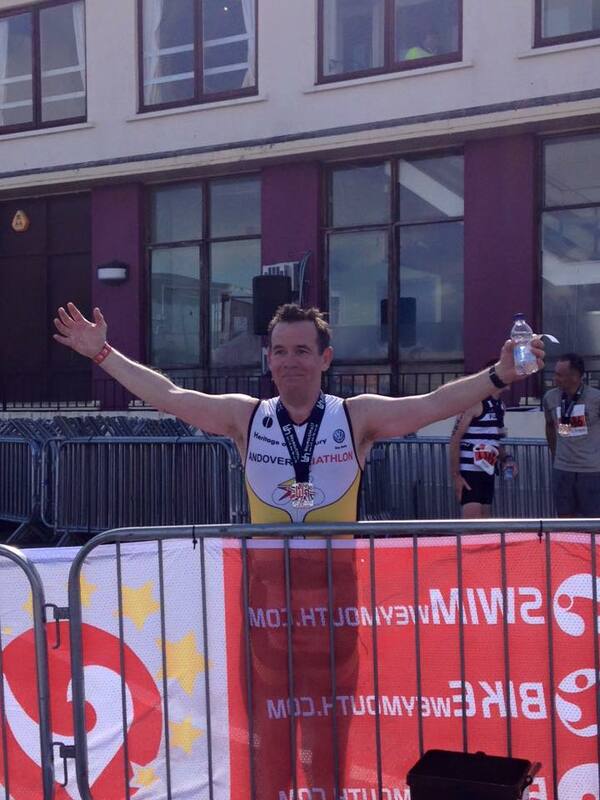 The term “Cold Turkey” was invented to describe the feeling I got about seven days after Ironman UK. Seven days was how long the sense of euphoria lasted – the period in which I would well up each time I remembered another moment from that extraordinary day in Bolton. It is also the length of time I could get away with wearing my finishers T-shirt without washing it before people started giving me a wide berth in the street. And by coincidence it is also how long it took me to realise that the looks I was getting when I wore my medal to go shopping in Sainsbury’s were not always looks of admiration. If I had paid closer attention I would probably have noticed that seven days was also the full extent of how long people were polite enough to appear interested whenever I dragged the conversation back to Ironman! Seven days then……nothing. The twelve hours a week of training, the diet, the conditioning, the planning, the online banter, the laundry and the sleepless nights leading up to the event all gone in a moment to be replaced with a vacuum, or more accurately The Ironman Blues. An empty feeling that the party is over but also a complete lack of motivation to get off my arse and do anything about it. Having suffered a minor attack of the blues after running the London Marathon in 2012 I came prepared this time taking the precaution of lining up some fun activities to fill the large M Dot shaped hole in my life. First up was the Ironman Barbecue. 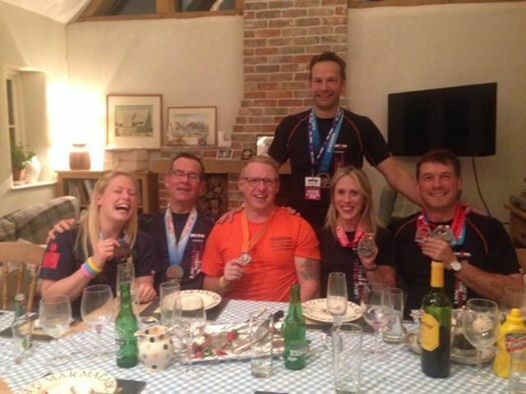 Seven of us from the mighty Andover Tri Club had completed Ironman races in June and July and that alone was worth a celebration. If you were an Ironman it was about as close to Iron heaven as you will get. We all sat down to dinner in our finishers T-shirt (washed! ), wearing our medal, drank beer and talked non-stop about our Ironman exploits, pausing only occasionally to let other people talk about there’s. I am not sure the partners saw it quite like that, but we had a great evening. As the drink flowed the tales of Ironman bravado got taller and the plans for next year got bolder. By midnight we were all going sub-12 next year (which would be a feat in itself as none of us got close this year!) and as we would all be there anyway, we agreed to have the 2015 barbecue in Kona!! The week after the barbecue our household was consumed by a major logistical trauma also known as Pony Club Camp. It is likely that the Task Force that was mobilised to sail to the Falklands on a flotilla of battleships took less kit with them than two 12 year olds took to spend a week camping and riding ponies ten miles from home in a period of mild weather, winds light to moderate. Anyway mission accomplished – they had a ball. After the emotional upheaval of Ironman and the organisational stress of camp we were off on holiday without a moment to stop and think about Ironman and the blues. Regular readers will remember last year that we went to the Mark Warner resort in Lemnos which had the feel of a correctional facility for people obsessed with staying fit – so we didn’t go back there. Instead we went to Mark Warner in Corsica which as far as I could tell was no different. We hadn’t even got off the plane before I had met my first triathlete! A bit like Lemnos the resort was full of middle-aged men and women who may have been hell raisers in their youth but who now were more concerned with morning runs than Tequila Slammers. No Jack Wills, Super Dry or Hollister here, it was strictly lycra. On a positive note, the daily group bike rides provided a whole new audience of people who wanted to listen and ask questions about my Ironman, at least for the first week. In the second week I was trumped by a new arrival who had just done the Marathon des Sables (seven marathons in six days across the Sahara) and even Ironman couldn’t compete. And even if it could, she had done two of those as well. By the time we got home Summer was almost over and Ironman seemed to be a small spec in the rear view mirror and any opportunity to develop a case of the blues had passed. All the focus now seems to be on next year – not because long distance triathletes are an organised bunch, but because the big races are all going on sale now and are selling out quickly. When I say quickly, I mean “Led Zeppelin Reunion Concert” quickly. The new Ironman 70.3 in Staffordshire which doesn’t take place until next June sold all 2,000 places in 15 minutes which was only eclipsed by Challenge Roth selling all 5,000 places in under a minute. It seems the appetite to suffer is alive and well in Britain! For now I have entered the Outlaw Half again (another one day sell out) which was a feat in itself. 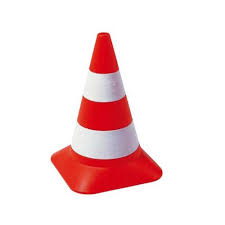 Nothing they throw at me on the day of the race will match the stress levels of trying to enter a race online using a Kindle and a dodgy hotel Wi-Fi connection in Corsica while the organisers were regularly posting updates on Facebook of how quickly places were going. Anyway that one is booked and I can forget about it for a while. The priority now is to get my training on with only six and a half weeks left until the European Championships at Challenge Paguera and my first outing in a GB tri suit. More on that another time. For now enjoy the last few weeks of the season. Barely able to contain myself, let me start at the end! 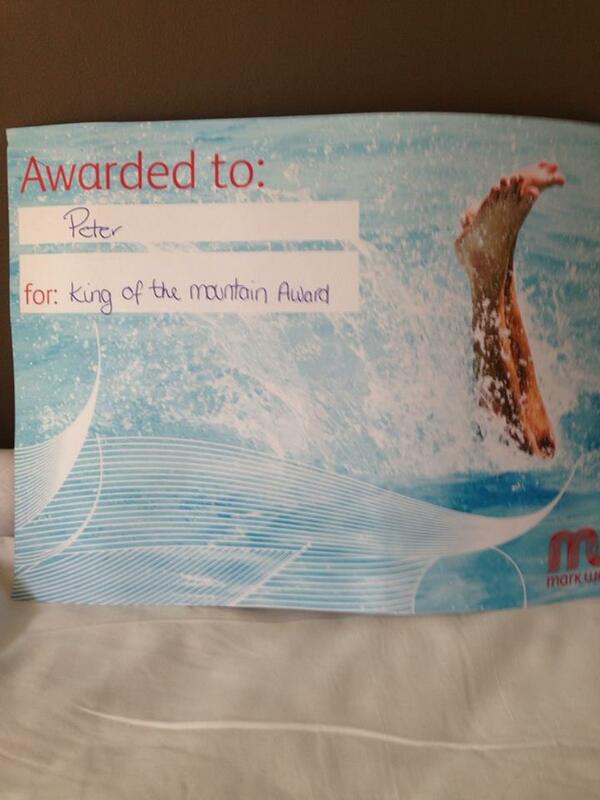 For the first time in my brief triathlon career I found my way onto a podium! I am super-excited to have placed 3rd in my age group at the Outlaw Half at The National Water Sports Centre in Nottingham – and yes, there were more than three of us competing in my age group; 29 to be exact! 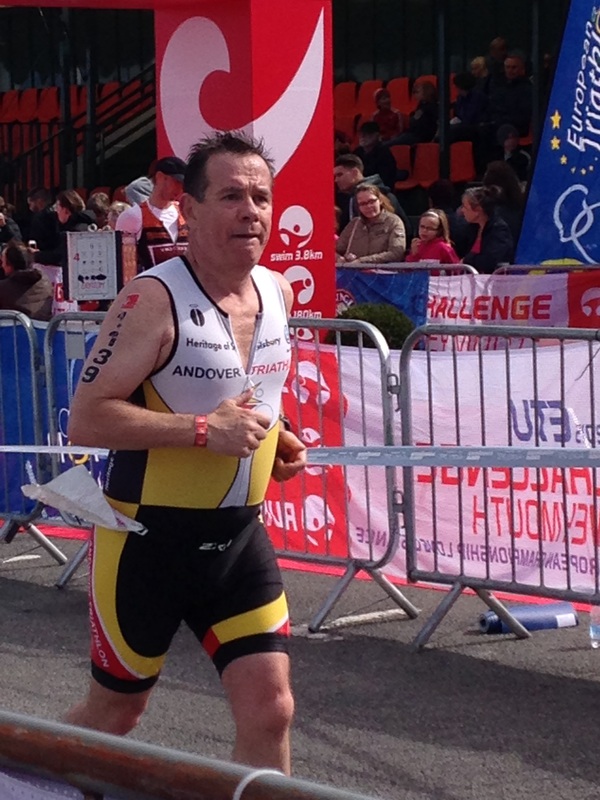 This was my first outing of the season and I had booked it as a build-up race for Ironman UK in July. With Ironman now less than seven weeks away I wasn’t absolutely sure how to approach this. My thinking was to swim the swim (that may sound obvious but I know what I mean), push it on the bike and see how I felt when I got to T2. The swim was in the rowing lake at Holme Pierrepont and two things struck me as I got into the water to warm up. First, it was a beautiful clear day and the outward leg of the swim was directly into the sun which at 6.00am was still low in the sky so sighting would be a real challenge. Second, it stank like a swamp and visibility underwater was zero! I think this was because the bottom had been churned up by the first two waves to set off. Definitely a day to avoid an accidental mouthful of water. As the countdown reached one minute, I made my way to the back of the bay for those aiming for a sub 40 minute swim – and then we were off! With sighting virtually impossible I just followed the crowd for the first few hundred metres. I tried a couple of times to jump onto some faster feet but without much success. They were either too fast and disappeared into the distance, or in one case not fast enough. Other than that the swim was pretty steady and uneventful and in no time (37 mins to be accurate) I was out of the water and on my way to T1. I made a meal of transition. All went well until I picked up my bike and headed for the exit before realising I had not put on the bike shorts I wanted to wear over my tri suit for extra padding. I turned back and took ages to get them on (more about them later!). Four minutes in T1 was too long. I was looking forward to the bike leg. The course was pretty flat with just a few slightly rolling sections and only one proper hill. This has always been my weak leg but I have worked hard over the winter to try and put that right and I was keen to see what improvement, if any, I had made. 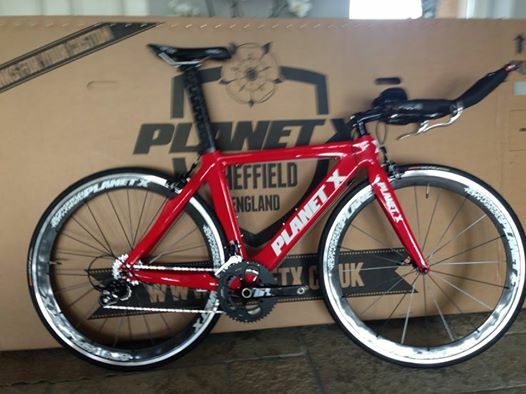 It was also the first time I was taking my Planet X TT bike into battle. I felt good on the bike right from the start. At 56 miles, this was longest ride I had done on my TT bike and I was curious how I would cope for almost three hours in the aggressive position needed to stay on the aero bars. The answer is that I coped OK, although I sat up a few times towards the end. There is only so long a man can tolerate the nose of saddle up his arse. The bike leg was really enjoyable. We went through lots of local Nottinghamshire villages where people turned out in numbers to cheer us on. Lots of the roads were closed or sectioned off for us and every major junction was marshalled with cyclists getting right of way. Great work by the organisers. The only downer was the last mile back into the Water Sports Centre where we had to endure some awful road surfaces, over a dozen speed bumps and a cattle grid! As I pulled into T2 I stopped my Garmin at 2.55hrs with an average speed of 19.6mph (31.3kph). Not Bradley Wiggins but fast for me – a 15% improvement on my best race time over a course of this profile and distance. I think the “X” and I have bonded! I must have still been dreaming about my bike time in T2 because I made a hash of this transition as well – although that wasn’t to become apparent for a while. Time wise I was in and out in just over a minute. I felt good almost immediately on the run. I was light on my feet and managed to quickly settle into a pace of 8.30mins without too much difficulty. What didn’t feel fine was how hot I was – I know it was sunny but not that sunny. Then after about five minutes I realised that I forgotten to take my bike shorts off in T2 so I was running with two layers on. Idiot! At the first drinks station I explained to a lady volunteer what I had done and dropped my trousers and handed them over as she looked at me with an open mouth! The run was two laps of a course which was roughly 3 miles on the tow path of the River Trent and 3 miles round the perimeter path of the rowing lake. This meant that at about 6.5 miles you had to run straight past the finish and the packed grandstand – safe to say that was a low point. The run had a great atmosphere. Lots of feed stations, which were just as well organised and as cheerful as the ones on the bike course. As I reached about half way on the first lap the bike guiding the leading lady came past me, closely followed by Catherine Faux the eventual overall ladies winner. Great to see someone of that standard up close on the race course. As she passed me I said well done and she said thank you. Me and Catherine new BFFs!! As I got back to the lake for the second time I was feeling OK – no more aches and pains than you would expect 5 hours into a race. With three miles left I pushed my pace up a little and was really pleased with how I responded. I ran the last mile in 8.05mins – my fastest mile of the run – a glowing advert for Andover Tri Club’s weekly track sufferfests – thanks Dan and Sam! 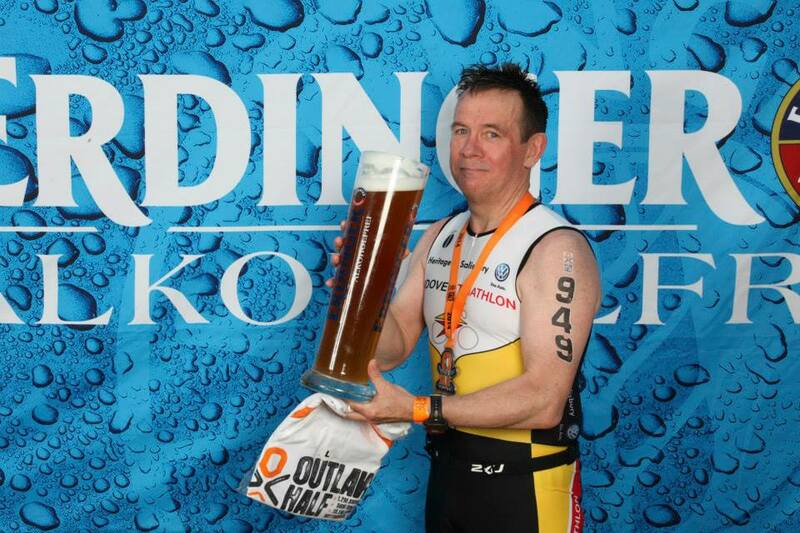 As I approached the finish I turned left onto the red carpet past the grandstand which was still packed and very noisy and crossed the line in 5.32hrs – a new half-iron distance PB. My half marathon run time was 1.53hrs. The post-race organisation was incredible. A medical check, medals, a great technical T shirt and then into a pop up restaurant for a post-race feed. On the menu was curry, Chinese, Thai, Lasagne, Spag Bol, Chilli as well as list of puddings. Sods Law – I had a stomach full of Powerbar gels and no appetite. All I wanted was a cup of tea! And then to really test my stomach I was offered a 3-litre glass of beer. Great photo but that’s all! Before I headed back to transition to pack up, I went and had my result printed out but couldn’t read it without my glasses. A friendly volunteer (they were all friendly) read them to me. My times were no surprise as I had measured them all on the way, but then he said: “Position in category third”. At first I thought it was a mistake so I asked him to read it again. “Third”. When I checked the results later I was only one minute behind second place – I am thinking bike shorts!! So all in all a real confidence booster for me as I head into the last block of training for Ironman UK. There I plan to pace the whole race much more conservatively, but it is good to know that I can push it like I did here and still finish strong. A final word for the organisers. This was one of the best organised races I have done – some real attention to detail and every decision feels like it was made with the athletes in mind. And the 300 or so volunteers who were cheerful, encouraging and endlessly helpful – thank you to all of you – you were awesome. I would do this race again in a heartbeat.